What’s music like on the Samsung MS750 Sound+? Is Samsung’s MS750 Sound+ good for movies? Is the Samsung MS750 Sound+ worthy? 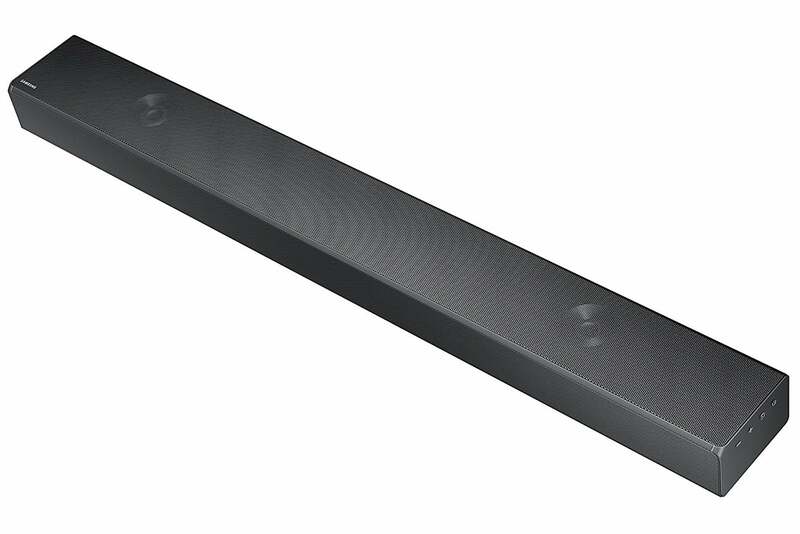 Samsung’s flagship soundbar, the MS750 Sound+, knocked my socks off with its musicality. It sounded so utterly spectacular for the price—less than $450 on Amazon at the time of my review—that I wondered why Samsung bothered to ship its optional wireless subwoofer along with it. But then I watched a few movies. The deeply satisfying bass response the speaker delivers solo is much less impressive with movies. On the bright side, Samsung is currently offering an even deeper discount on its companion sub: The SWA-W700/ZA is currently on sale for just $299.99—a $200 discount off its regular MSRP. The combination is almost good enough to knock Yamaha’s YAS-706 ($800 at Amazon) off its perch at the high end, but Yamaha has the superior multi-room ecosystem in MusicCast. The MS750 is a big speaker. Measuring 45.3 inches wide, it’s an ideal companion for a 55-inch TV, and wouldn’t look out of place with a larger set. 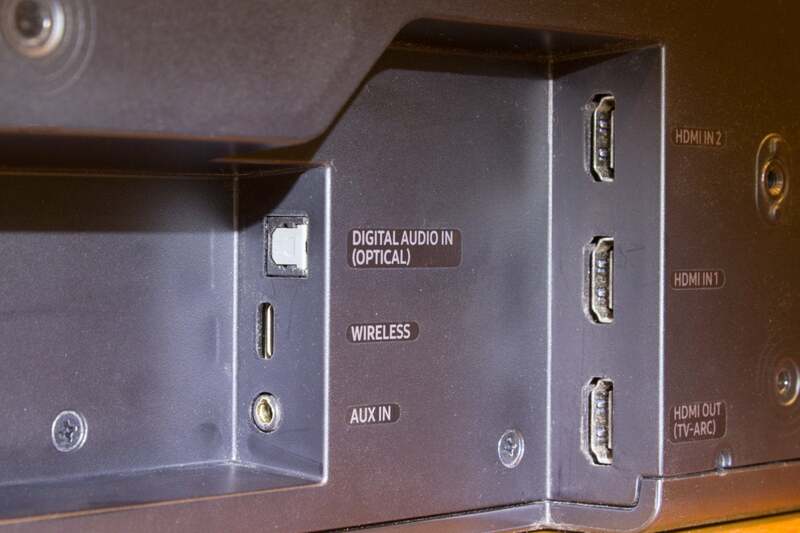 It comes with the brackets needed for wall mounting, but at just 3.1 inches tall, it won’t obscure the front of most TVs if you set it in front in your entertainment center (I paired it with a 55-inch Panasonic Viera TC-55LE54). It might, however, block your TV’s IR receiver—it did in my case—and the speaker doesn’t have have an IR repeater or pass-through. 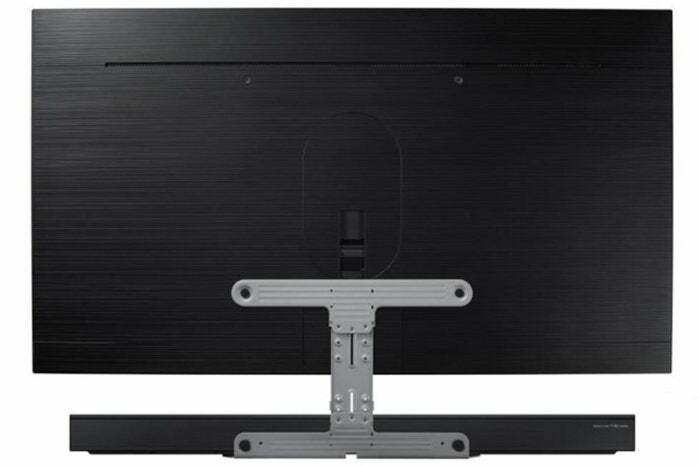 If you own a compatible Samsung TV, you can buy an optional mounting kit (Samsung part number WMN300SB, $50) that hangs the speaker from the TV and uses a single cable for both signals and power. When paired with a compatible Samsung TV, one remote can control both devices. Mounting and cabling features render the HW-MS750 an especially good match for Samsung TVs. Playing the CD version of “I Dug Up a Diamond,” from the Mark Knopfler/Emmylou Harris collaboration All the Roadrunning, I could almost feel in my chest the three bass notes that come in on the second downbeat. The low frequencies were pleasantly palpable, but they didn’t overwhelm Knopfler’s guitar work or the lovely vocal harmonies the Dire Straits frontman produces with Harris on this track—and on the entire album. I had similar experiences with some of my other favorite music, including Bruce Cockburn’s “Mango,” from his Breakfast in New Orleans, Dinner in Timbuktu album; and the title track to Lucinda Williams’ “Car Wheels on a Gravel Road.” Guitars, cymbals, and pianos sparkled, vocals sounded stellar, and bass response was more than satisfying. I had ripped each of those tracks from CD and encoded them in FLAC. The MS750 can also decode AAC, ALAC, MP3, OGG, WAV, and WMA files. Samsung says the MS750 upconverts lower-resolution (8- to 24-bit) audio files to 32-bit resolution before converting them to analog, but it doesn’t go into any detail beyond that. I know that upsampling can eliminate digital artifacts, but without knowing more about the components in the signal path or how the signal is processed, it’s hard to say if that claim is more than just marketing fluff. As much as I like the way the MS750 reproduces music, I’m leaning toward fluff. The MS750 has on onboard digital signal processor (DSP) with five presets: Standard, Music, Clear Voice, Sports, and Movie. There’s also a surround mode that fires up an audio remix algorithm and enables its upfiring tweeters (more on that in a moment). Samsung’s HW-MS750 Sound+ soundbar has two HDMI inputs and one output with ARC support. 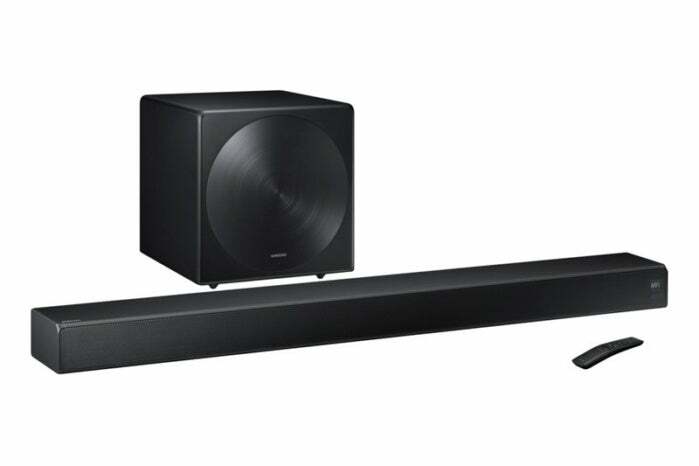 The MS750 is a five-channel soundbar that supports Dolby Digital and DTS surround-sound codecs, but you’ll need the aforementioned subwoofer and Samsung’s $180 SWA-9000S/ZA wireless surround speakers (available at Amazon) to get true 5.1-channel surround sound. There is no support, however, for the high-resolution codecs Dolby True HD or DTS Master Audio that you’ll find on Blu-ray and Blu-ray Ultra HD discs. As I’ve already said, the MS750 sounds great with music all on its own, but its mid-range drivers don’t deliver movie soundtracks with the authority I’d want for home theater use. Adding the SWA-W700/ZA subwoofer immediately eliminated that shortcoming. Equipped with a 10-inch rear-firing polypropylene woofer, this 32-pound beast brings low-frequency effects to life. The sub connects to the soundbar via a proprietary wireless dongle, so the only cable you need to worry about is the power cable. Apart from a pairing button, the sub has no controls: You can’t adjust its crossover frequency or its phase. These are set at the factory, but I think most people won’t miss that level of customization. The Samsung HW-MS750 has upfiring tweeters, but it is not capable of decoding Dolby Atmos soundtracks. Watching Mad Max: Fury Road on Blu-ray was a very fun experience through the soundbar/subwoofer combination. None of the speaker’s DSP presets, however, delivered a satisfying surround-sound experience. Samsung didn’t send its surround speaker kit, but I’d want both it and the sub if I were buying this system. The MS750 had no problem filling my 13-by-19-foot home theater with sound. Even without the subwoofer, it got loud enough to run me out of the room. But there’s no reason to push the speaker that hard with either music or movie soundtracks—nor would you want to, as audible distortion begins creeping in long before you get to its maximum output. There are 11 drivers inside the soundbar enclosure, each of which is powered by a discrete Class D amplifier (the woofers get 50 watts per channel and the tweeters get 20 watts per channel). The front right and left channels each consist of a pair of 115x62mm paper-diaphragm mid-bass drivers, coupled with a single large (52mm) aluminum inverted-dome tweeter. The center channel consists of an identical configuration. That accounts for 9 of the 11 drivers. 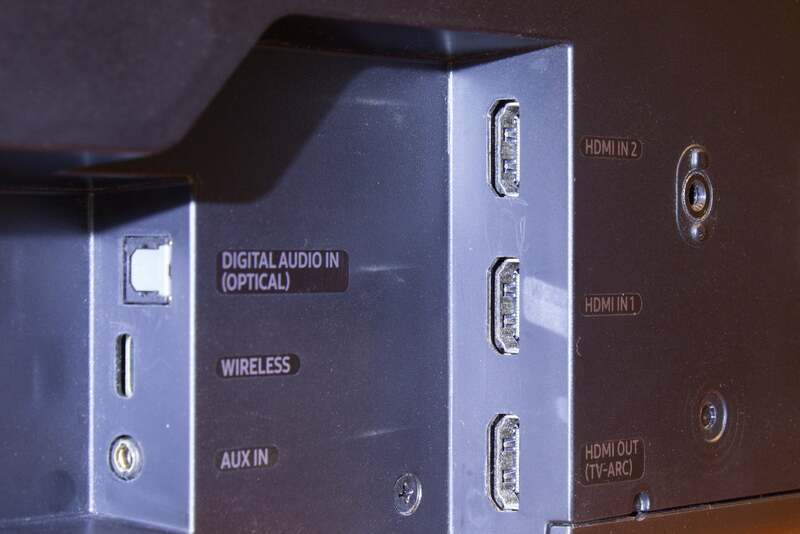 You’ll find one each of the most common analog and digital audio inputs on the bottom of the speaker. The remaining two drivers in the array are vertically oriented 43mm aluminum inverted-dome tweeters. Samsung says these upfiring tweeters work in conjunction with the front channels to “add a sense of horizontal and vertical space,” which is just what the object-oriented codecs Dolby Atmos and DTS:X are supposed to deliver. I asked Samsung if they would ever release a firmware update that would enable it to decode such soundtracks, but I didn’t get an answer. Samsung's Multiroom app can stream music from your phone, a handful of online services, or from a DLNA server on your network. If you’re using the MS750 with other audio sources, you’ll find most—if not all—the analog and digital inputs you’ll need. There are two HDMI inputs with 3D and 4K/HDR (60Hz) video passthrough support, one HDMI out with ARC (audio return channel) support; one optical digital audio input; and one 3.5mm analog auxiliary audio input. There’s also a proprietary connector for a wireless dongle that comes with the optional subwoofer. Samsung provides optical and power cables, but not an HDMI cable. There is no RJ45 jack, so you can’t hardwire the speaker to your network. You can use Bluetooth to stream music to this soundbar (it does not support the aptX codec), but you’ll get a much broader range of music sources by connecting the speaker to your Wi-Fi network (the MS750 has a dual-band 802.11ac Wi-Fi adapter onboard) and using the Samsung Multiroom app. 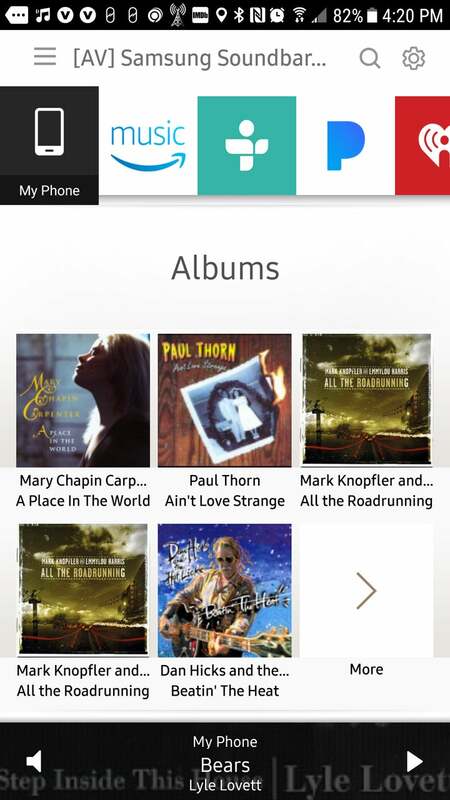 The app displays a series of sources across the top, starting with the smartphone the app is installed on, along with many of most the popular services (Amazon, Pandora, Tidal, and SiriusXM are included; Deezer, Last.fm, Apple Music, and Google Play Music are not. Spotify Connect is supported, which means subscribers can play to the speaker directly from the Spotify app.) Any media servers operating on your network will also be displayed at the top of the app. 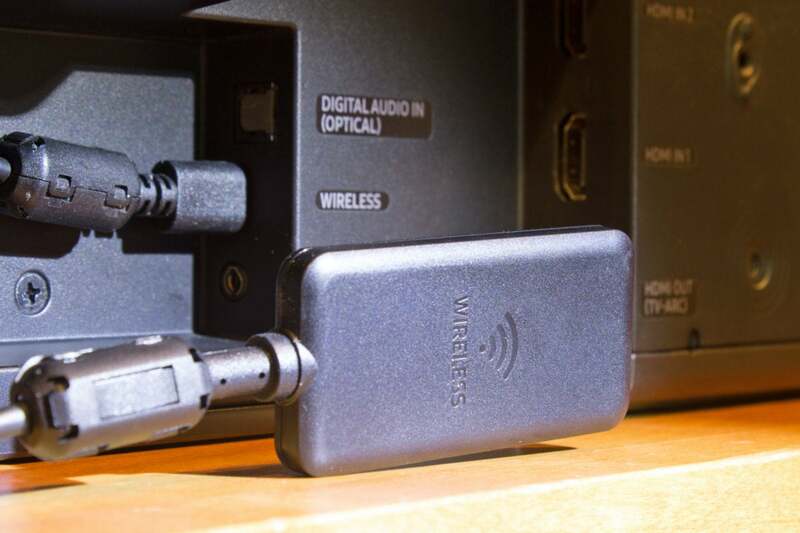 The wireless dongle that comes with the subwoofer eliminates the need for one cable. Samsung says you can theoretically operate up to 32 compatible speakers on your Wi-Fi network, but you might run out of bandwidth before you hit that number if you don’t have a very robust network. The optional surround speakers don’t use Wi-Fi, so they won’t eat into that maximum. I like Samsung’s MS750 Sound+ soundbar quite a lot. It’s great for music all by itself, but you’ll want to add the subwoofer for watching movies. There’s only so much low-end that mid-range speakers of any size are capable of delivering. Fortunately, both speakers are steals at their current prices: You can get both for $750. You can pair this wireless sub only with Samsung's soundbars, but it delivers a fabulous performance with the HW-MS750 Sound+ we tested it with.